It is not the honour that you take with you, but the heritage you leave behind. We Indians are so good at cherishing memories. Yet when it comes to living memory that we inherit by way of heritage; we simply turn a blind eye and let it be ravaged. Not surprising then that we may idolise Maharaja Ranjit Singh, but have ignored his precious heritage — Rambagh Palace complex, Rambagh Gate, Gobindgarh Fort and the Sham Singh Attariwala Samadhi complex, besides Pul Kanjri. Today as winds of restoration are blowing across Amritsar, the beauty of Maharaja Ranjit Singh’s legacy lying within the labyrinths of priceless architectural buildings is being re-constructed. The Punjab Government’s Department of Tourism had envisaged an ambitious project to conserve and revitalise this complex. With the two heritage sites, Pul Kanjri and the samadhi all but complete and the first phase of the other project nearing completion, it is time to take stock of what has been done. Indeed, on the surface much appears incomplete. As one gazes across the long kutcha road to Rambagh Palace, also known as Summer Palace, all one can see are the dust and the dug-up places. This whole restoration process, the damage done to flora and fauna and the inconvenience caused to people, peeves MLA Anil Joshi. But get talking toGurmeet Rai, India’s leading conservation architect, whose company is the consultant to the Rambagh complex, the Gobindgarh Fort and the Rambagh Gate, and many layers of past begin to peel off to unravel the original.Quips Rai, "One must understand that while plants can be grown back, heritage buildings are non-renewable resources. And the buildings of Maharaja Ranjit Singh much of whose legacy is in Lahore, even more so." She elaborates on the challenges involved, "To begin with, one has to recover before restoring." So at the Rambagh complex, the western deodhi, which used to be Maharaja Ranjit Singh’s darbar of sorts, the office of civil defence had to be moved out. Similarly, Gobindgarh Fort, though not a protected monument, had to be taken back from the Army, which had eventransferred the title to the Punjab Government. 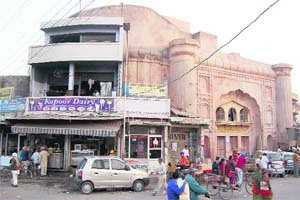 Rambagh Gate, too, housed a police station, which had to be relocated. Moreover, it’s not just the onslaught of time that has ravaged heritage but changes in subsequent periods in history like the British era, too, water down the authenticity of previous ones. Rambagh, an 84-acre of sprawling site declared protected by the ASI, is known only as company bagh among people, perhaps as a legacy of the East India Company. But Gurmeet can’t be easily deterred. Since details as well authenticity are important to her, she had to find the original blueprint. The only reference point she had was an archival painting of Rambagh ofthe early 19th century from Gulgashat-e-Punjab by Raja Ram Tota.Nevertheless, as she dug deep not only did she discover the original limestone lining but "water channels of the Sikh period were also revealed." She claims, "What a marvel of engineering it was — the scientific management of waterand horticultural practices." Today, the same feat cannot be recreated butthey do intend to make the public aware of its import. Also, wherever she found original material after scrapping off layers, which couldn’t be integrated with the restoration work, she and her team intend to use geotextile non-degradable material to cover it up so that in future if archaeologists dig they can find the material of the Sikh period." Dr Sukhjot Singh Behal, professor of architecture, Guru Nanak Dev University, Amitsar, can find little fault in the way the restoration work is being handled. Though others like Dr Sukhdev Singh, state convener of Intach, Punjab, opine that the work is progressing slowly thus endangering what has been achieved, but Dr Behal feels otherwise. Says he, "You can’t compare restoration with modern-day construction since the originality is at stake. The intrinsic essence of conservation cannot be compromised with." Undeniably, conservation is not just painting the doors, ornamentation, piecing things together or faking it but capturing the original spirit. So Gurmeet has gone to great lengths to replicate the original brick pattern and find the right paint finish on the walls. 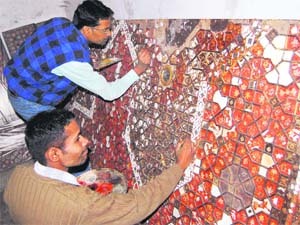 Besides getting the architectural details of the building right, there is also the question of art conservation. For instance, Rambagh or Summer Palace housed exquisite ceilings done in Khatamband technique, which is native to Kashmir but had been eaten away by termite as also damaged by over paint. Maninder Gill, an art conservator, whose company has restored paintings at Pul Kanjri, is busy breathing life back into the Khatamband ceilings of the Summer Palace. He says,"Restoring these ceilings hasn’tbeen easy. For one, the wooden panels are very small. Taking off the ceiling has been arduous. After restoration on them is finished, putting them back will be equally onerous." Rambagh Gate, which still has some encroachments, also housed a police station, which had to be relocated. Among challenges involved in art conservation are getting the right kind of manpower, more so for projects like Pul Kanjri, where the remoteness of the site itselfpresented an impediment. Interestingly, since both the Pul and Sham Singh Attariwala Samadhi complex are situated far away from the city, the relevance of restoration, which is almost complete, assumes another dimension — what to do now. More so, since at the samadhi complex,as Bhai Sawinder Singh shares that except forthe shaheedi diwas mela in February hardly anyone visits the site. Though samadhi is a private trust and there is little the government can do beyond repairing it, says Geetika Kalha, Principal Secretary, Tourism and Cultural Affairs, Punjab, "Monuments are not museum pieces to be locked away." Actually, the tourism department has an ambitious media plan to put all these on the tourism circuit, Adds Kalha, "Tourists are already thronging Amritsar. We have to make them stay longer by offering them a bouquet of various destinations." 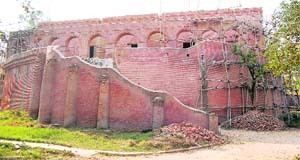 A museum is under construction at Gobindgarh Fort. For Gobindgarh Fort, they are even toying with public-private partnership. Once the restoration work is over, three museums, including the one on Ranjit Singh’s military history, and another on the Sikh regiment tracing its history back to Khalsa Fauj, will be ready. A boutique kind of hotel is also being envisaged to offer people an authentic experience. Similarly, for Pul Kanjri talks are on with an NGO Springdale, which will take care of its upkeep on a no-profit basis.But says Kalha "However, we can’t hand over the monument just like that. There has to be a memorandum of understanding. "So while Rambagh Palace will become a museum, the master plan also includes an open-air theatre and an art gallery. So, while Kalha asserts the need to make a building come alive, Rai too, says that heritage spaces will have a meaning only if these are converted into vibrant cultural nuclei. Neeta Mohindra, a visual and performing artist of the city, agrees that there is ample scope for art activities, including art workshops, within and against the backdrop of the fort and the palace. The opinion is unanimous — architecture must come into public domain but in a planned way. The use of space can’t be detrimental to the site as is happening in Rambagh Gate, which has been restored yet lookslike a monstrositybecause of encroachments and shops jutting out from the edges of its walls. Says Rai, "What conservation needs more than anything else is political will and a legally enabling regime. One has to begin with public assets before moving on to the private and for public spaces there has to be a proper policy. "Kalhashares that they have already asked Unesco to give them a cultural management plan. Clearly, more than a beginning has been made in earnest and in the right direction to reveal once again Maharaja Ranjit Singh’s contribution to history. GOBINDGARH FORT of Gujjar Singh Bhangi, one of the most striking edifices of the city, was consolidated by Ranjit Singh and had three lines of defence, several bastions and interesting European feature like ravelins. It is believed that the treasury of Ranjit Singh was kept here. After the British took over, a large cantonment was built around the fort and numerous living quarters, including a six-bed hospital, came up. A museum is being built that will house the military artefacts of Ranjit Singh. The construction of Rambagh Fort was started by Ranjit Singh in 1819 AD. In the middle of Charbagh lies his Summer Palace that was originally constructed at a cost of Rs 1,25,000. In the first phase, the platform encircling the palace and the road leading to the palace will get ready. Summer Palace will house artefacts belonging to Maharaja Ranjit Singh’s times. 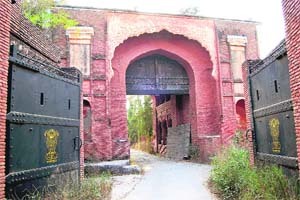 Rambagh Gate, the only surviving gate built during Maharaja Ranjit Singh’s time, was beautifully designed by architects from Delhi under the supervision of Faqir Azizuddin. Today, on its edges stand shops yet within the gate, especially on its first floor the ambience of yesteryear pulsates. The tourism department is thinking of setting up a caf`E9 here. PulKanjri, near the Wagah border, as legend goes, was the recreation site of the Sikh monarch, where he was entertained by one of his favourite dancers. Set amid picturesque fields, this heritage site has been restored to its old glory. 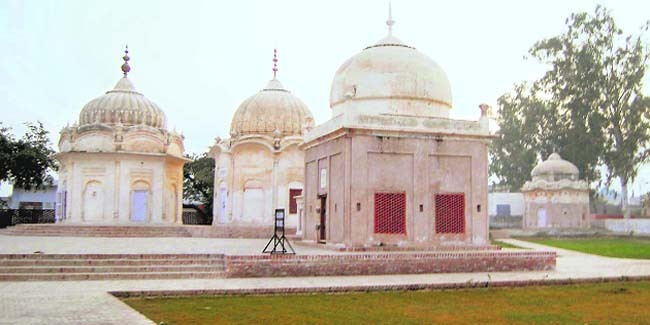 Yet another heritage site is the Sardar Sham Singh Attariwala Samadhi complex in Attari village. Sham Singh Attariwala was a brave general in the army of Maharaja Ranjit Singh.